The RDA Plenaries are working meetings that bring together a unique community of data scientists, librarians, computer and domain scientists, policy makers and strategists and are an excellent opportunity to meet and discuss concrete actions and plans. If you are looking for feedback or support for an initiative you have and would like to build a group around it, don't hesitate to submit an application for a Birds-Of-a-Feather meeting. It will help you identify an audience, build support and start the work on your Case statement or Charter for an RDA Working or Interest group. RDA is a community-powered organization, the breakout sessions play a key role in the success of our plenaries. RDA Working & Interest groups are free to choose the format and content of their sessions while we strongly encourage the organisation of working meetings. Groups are also invited to submit joint meeting applications to explore potential synergies with other groups. For the session descriptions we provide a template including examples and ask the session proposers to describe their sessions accordingly. Please use the indicated forms to submit your applications. 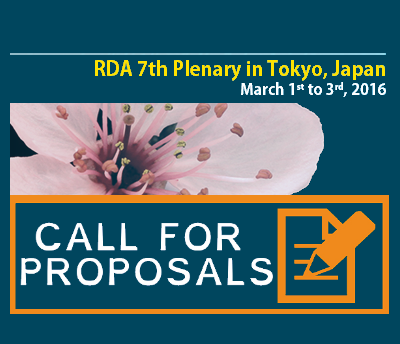 Requests will be built into the program for the Plenary 7 in Tokyo, Japan, March 1-3, 2016. Please note that we may not be able to accept all submissions.